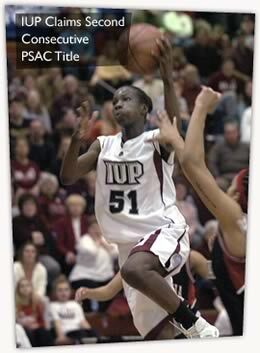 IUP outscored California 14-1 over the final 7:04 to rally from a nine-point deficit and post a 67-63 victory over the Vulcans to claim its second straight PSAC women’s basketball championship Saturday night at Memorial Field House. IUP (27-4) earned the automatic bid from the PSAC to the NCAA Division II tournament and will likely be named the host of the East Region tournament when the sites and pairings are announced Sunday night. California (24-6) will also be in the field of eight despite losing to the Crimson Hawks in the PSAC final for the second consecutive year.